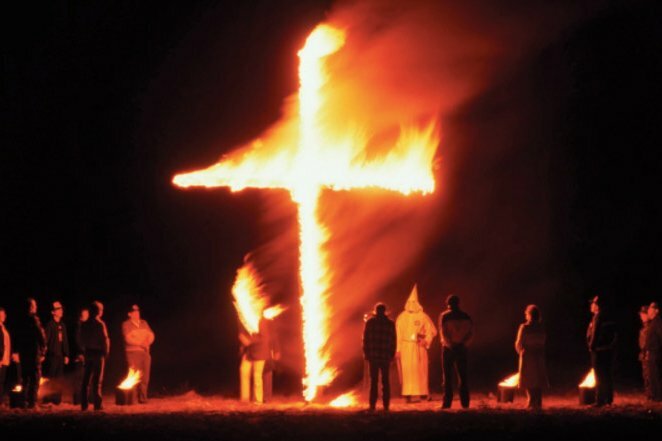 The Ku Klux Klan, with its long history of violence, is the most infamous — and oldest — of American hate groups, according to the Southern Poverty Law Center. Fewer hate groups were active in Philadelphia last year even as they continued to increase at the national level, according to the Southern Poverty Law Center. The SPLC, a nonpartisan group that monitors hate group activity across the United States, listed four such groups at work in Philly, down from seven in 2016. The four active groups in 2017 include three black nationalist organizations – the Nation of Islam, the Israelite School of Universal Practical Knowledge and the Israelite Church of God in Jesus Christ. The fourth was a racist skinhead group known as Be Active Front USA. Across the country, the number of hate groups continued to rise in 2017 as neo-Nazi, anti-Muslim and black nationalist groups all expanded significantly. The SPLC, which released its annual "Year in Hate and Extremism" report on Wednesday, counted 954 active hate groups last year, a 4 percent increase from 2016. The report claims President Donald Trump invigorated white supremacists, prompting a backlash from black nationalists. The three black nationalist groups in Philadelphia, and two Nation of Islam chapters operating in South Jersey, were all active in 2016, too. "The presence of those organizations in that area is notable," said Ryan Lenz, senior investigative reporter for the SPLC. "I think that's reflective of a nationwide trend, seeing these groups grow in number." Nationwide, black nationalist groups increased from 193 active groups in 2016 to 233 last year – a 20-percent jump. The increase was not surprising, said Heidi Beirich, director of the SPLC's Intelligence Project. Black nationalist groups tend to increase in response to white nationalism. "These groups are taking advantage of rising racism and hatred in the mainstream – as well as policy decisions by the (Trump) Administration to pull back on civil rights and police reform – as ways to attract people to their movement," Beirich said. The black nationalist groups listed as hate groups all espouse anti-Semitic, anti-LGBT and anti-white views, Beirich said. They "have nothing in common" with civil rights organizations like Black Lives Matter, nor do they have any political power. "These are not organizations that have their members in administrative appointments," Beirich said. "These are not people who are deciding our policies. They don't have an equivalent of a Steve Bannon or a Steve Miller in the White House." White nationalist groups also grew at significant rates last year, Beirich said. Neo-Nazi groups increased by 22 percent, rising to include 121 active groups nationwide. Anti-Muslim groups increased by 13 percent while anti-immigrant groups jumped by 57 percent. Two prominent neo-Nazi and white nationalist hate groups had active statewide chapters in both Pennsylvania and New Jersey. They include The Daily Stormer, a neo-Nazi website that has spawned activist chapters, and Identity Evropa, a white nationalist group known for distributing hate propaganda on college campuses. Racist flyers were posted at several area colleges last year, including the University of Pennsylvania and Drexel University. "It's not surprising, considering that ... these two Identity Evropa groups that are working heavily to make sure their presences are known on university campuses," Lenz said. In the Philadelphia region, the Shoebat Foundation in Newtown, Bucks County and Micetrap Distribution in Maple Shade, Burlington County also remained active in 2017. The SPLC consider the Shoebat Foundation an anti-Muslim group and Micetrap Distribution as a racist music label. Further away, the SPLC lists the H.L. Mencken Club in Elizabethtown, Lancaster County as a white nationalist group and the Reformation-Bible Puritan-Baptist Church/Vatican Assassins in Newmanstown, Lebanon County as a general hate group. There also is a racist skinhead group – the AC Skins – operating in Atlantic City, according to the SPLC. But while the number of black nationalist groups and neo-Nazi groups soared in 2017, one of the oldest hate groups saw its chapters fall off precipitously. Ku Klux Klan chapters fell from 130 groups in 2016 to 72 last year – a 21-percent drop. "I just don't think this new-wave, alt-right – with their flashy haircuts and their polos and their khakis and this kind of clean-cut look – can relate to the Klan," Beirich said. "That's not the image of what they have of what white nationalism should be." Despite the decline, Pennsylvania still had four active Klan groups last year, according to the SPLC. In all, 36 hate groups operated in the Keystone State, down slightly from the 40 groups that were active in 2016. "Pennsylvania is an interesting geographic location," Lenz said. "The concentration of hate groups in Pennsylvania is in the central part of the state but there is a spattering throughout." There were 17 hate groups active in New Jersey last year, a slight increase from the 15 active groups in 2016.